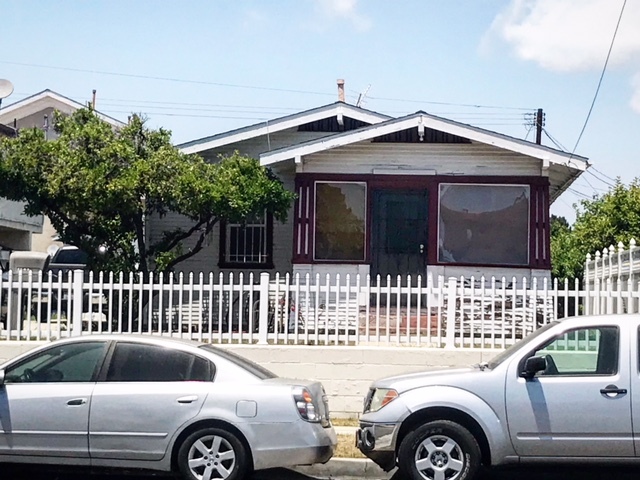 DESCRIPTION: GREAT OPPORTUNITY TO BUY A 2 BEDROOM, 1 BATH, FIXER HOME IN THE HIGHLY DESIRABLE SOUTH BAY, HARBOR GATEWAY AREA (L.A. CITY). THE HOME FEATURES A LIVING ROOM, KITCHEN AND ENCLOSED FRONT PORCH. BUYERS TO VERIFY ALL PERMITS. LARD 1.5 LOT (SUBJECT TO GENERAL PLAN). POSSIBLE DEVELOPMENT SITE. BUYERS SHOULD CHECK WITH THE CITY OF LOS ANGELES FOR CURRENT BUILDING REQUIREMENTS AND RESTRICTIONS. GREAT CENTRAL LOCATION. NO COURT CONFIRMATION. LOT SIZE: 7,572± SQ. FT.